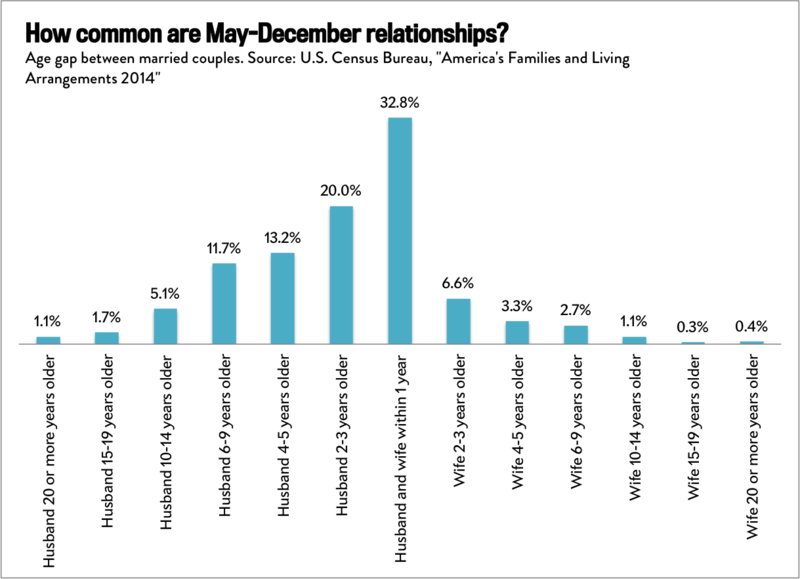 Stats about America’s married couples: How common are May-December relationships, and other fun questions answered. ’Til an unforeseen blow to our finances curdles our marriage and does us part. “Useless” is hopefully a slight exaggeration here, but I won’t pretend that what I’m about to present counts as vital information for living in a democracy, or something. The U.S. Census Bureau came out with its annual supplement on families and living arrangements today, and while digging around I found some cool stats about married couples.1 For instance: Ever wonder what fraction of husbands are significantly older than their wives, or vice versa? Behold. The Census estimates that roughly 1 out of every 100 marriages is between a man and a woman at least 20 years his junior. Just 0.4 percent involve a woman that much older. (It’s worth noting that once you get to numbers that small, it’s probably a somewhat rough approximation.) As a living, breathing human being with access to a television and other assorted media, you likely guessed that it’s far more common for couples to involve an older man than an older woman. But here’s your confirmation, in graph form. What about wives who outearn their husbands? It’s still far from the norm, but not totally rare. 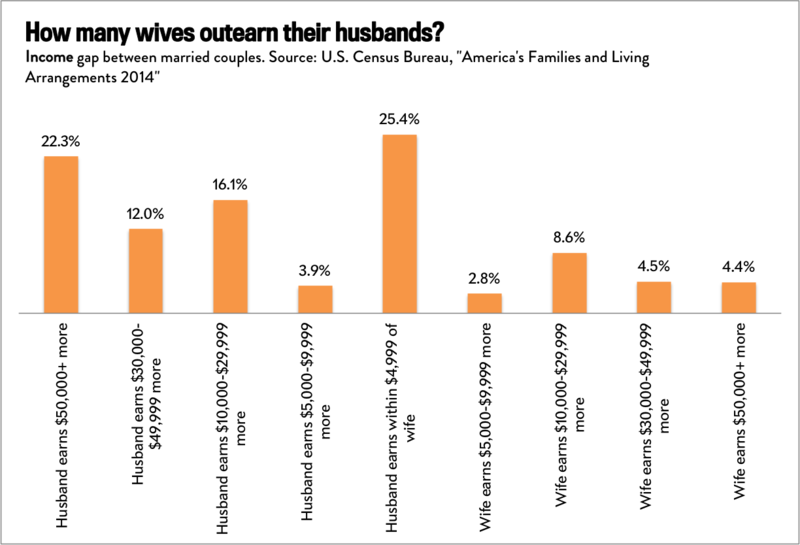 As of now, the Census thinks that about 20 percent of women earn at least $5,000 more than their spouse. Full-time stay-at-home fathers, however, are still basically unicorns. 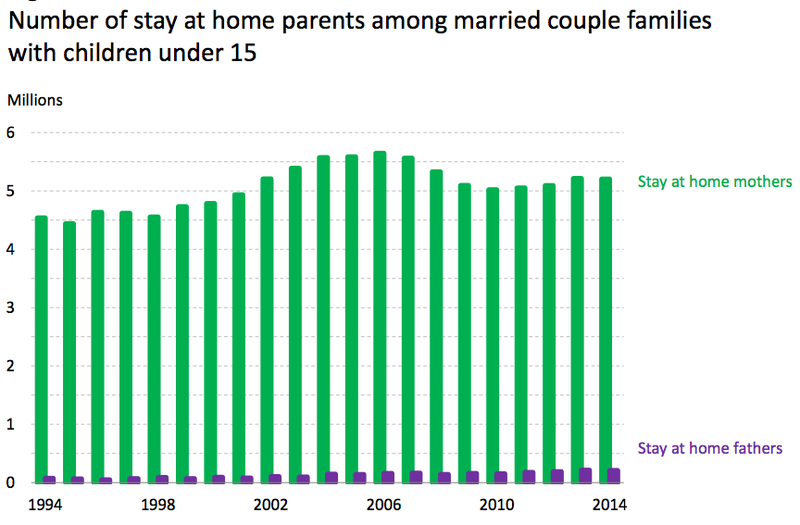 Out of more than 21 million married couples with children under 15, just 211,000 husbands, or slightly less than 1 percent of them, met the Census’ definition of a stay-at-home parent, meaning they were out of the labor force for the past year in order to care for family. That definition doesn’t count men who work part-time at home while mostly taking care of kids, of which there are a few, but it seems reasonable enough to me. So there you have it. In America, it’s more common to find a husband at least two decades older than his wife than one who stays at home with the kids, according to the Census. Make of that what you will. 1 Sadly, the Census only appears to include hetero couples in this analysis.